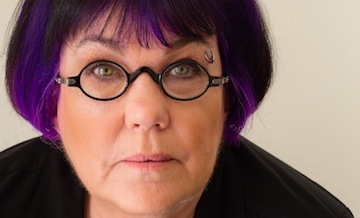 ECW contributor Meg Thompson Groeling released her first full-length book, The Aftermath Battle: The Burial of the Civil War Dead, on Oct. 19—serving up a perspective as unconventional as her purple hair. Groeling, 65, who is currently pursuing a degree in military history, has proven that being the outlier can be a beautiful thing. According to Groeling, while being a woman in a predominantly male-run field hasn’t always been easy, her unique perspective is one that adds to an important conversation. Groeling, an elementary math teacher at Brownell Middle School in Gilroy, California, said this book was just another exercise in learning “stuff [she] didn’t know”—much like her recent experiences with the Common Core curriculum. The Aftermath Battle deals with war’s implications on society. Instead of focusing on the logistics and statistics of the battle, like many Civil War writers do, Groeling said her hope was to shed light on how soldier’s deaths were, and are still being, dealt with. In essence, The Aftermath Battle picks up where the battle left off. According to Groeling, the physical process of collecting and burying bodies changed as well. Those who were lucky enough to come home alive faced struggles as well. Overall, Groeling’s main hope is to show how the Civil War served as a catalyst for change and that, in many ways, we’re still continuing to fight the war. While The Aftermath Battle was a long-standing effort of Groeling’s, she said that she has a busy schedule and does not plan to cut back on the researching and writing that she loves to do. Groeling, a self-proclaimed “learner,” said her second book, which focuses on the life and death of Colonel Elmer Ellsworth, is being set up for publication in the near future. The Aftermath Battle can be ordered online at amazon.com. This entry was posted in Books & Authors, Emerging Civil War Series and tagged aftermath of battle, Burial of Civil War Dead, Liam McGurl, Meg Groeling, Meg Thompson, Meg Thompson Groeling, The Aftermath of Battle. Bookmark the permalink. 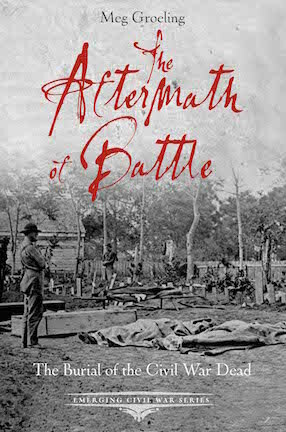 New book: Meg Thompson Groeling’s “The Aftermath of Battle: The Burial of the Civil War Dead” is now available. Liam–lovely article! I wish I could live up to your words!! I appreciate everything, and I hope you like the book as well. Again, thanks. Congrats, Meg! I’m putting your book on my Christmas wish list. Ho! Ho! Ho! I am indebted to you for a missed phone call, which I will explain some day over an adult beverage, so maybe I shall pass along your wish to the Big Guy! Or Krampus! !